More than 50 pages of exclusive documents and photos. 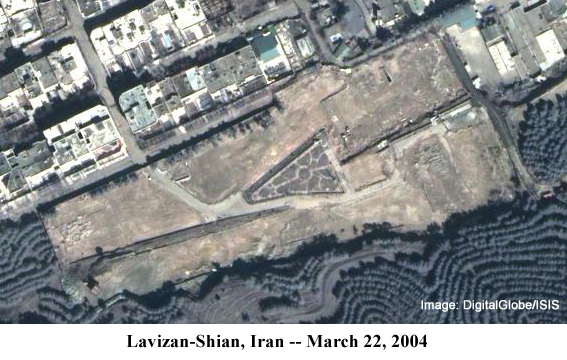 The livestock truck came to a jolting stop alongside a cemetery just south of Tehran, Iran. A handful of waiting soldiers had been expecting its arrival. At the rear of the vehicle, a canvas cover was flung aside and a man in his late 30s hopped out. He was late, so the soldiers -- security men from the Qods Force, an elite arm of Iran's Revolutionary Guards -- wasted no time. They escorted him through the cemetery and whisked him into a secret tunnel that led to an elaborate underground bunker. The meeting was underway. The official hosting the gathering was Ali Akbar Nateq-Nouri, a top advisor to Iran's Supreme Leader, Ayatollah Ali Khamenei. With him were Iranian intelligence officials involved in planning overseas terrorist operations. The guest of honor was there, too, and would soon gain worldwide notoriety: Dr. Ayman al-Zawahiri, the top deputy to Osama bin Laden. Zawahiri had come to discuss Al Qaeda's latest plans, and to relay his boss's keen desire to cooperate more with Iran. 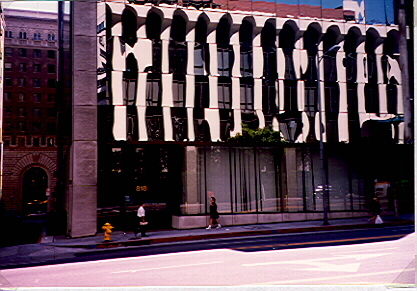 It was January 2001, eight months before the attacks of September 11. 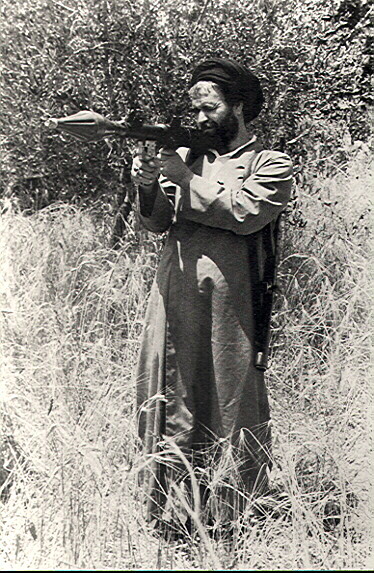 The late arrival, who now entered the room, was critical to Al Qaeda's strategy. For 20 years, Zawahiri had been working with Iran's Revolutionary Guards, and his main partner had been this man whose youthful appearance belied his cruel nature. 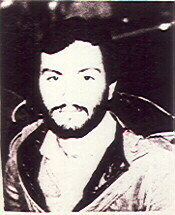 He was Imad Mugniyah, Iran's star operative, a terrorist with legendary skills and the mind of a psychopath. Lebanese by birth, he had risen over the years to become the top military official in the Iranian-backed terrorist organization Hezbollah. Mugniyah's assistance in the preparation for the September 11 attacks has long been kept quiet by intelligence officials. But one of the security men present at this meeting outside Tehran later fled Iran and agreed to tell his story. The picture that emerges from him, along with other Iranian, U.S. and European intelligence sources, is one of a master terrorist still waging his decades-long war against the West. He is a man few people outside intelligence circles know by name. Yet Mugniyah is believed to have killed more Americans before 9/11 than any other terrorist -- and he helped Al Qaeda pull off its biggest day of destruction. Some believe that Mugniyah has now joined forces with the terrorists doing battle with American soldiers in Iraq. For years, the only known photographs of Imad Mugniyeh were an early passport photo (left) and a snapshot taken of him in Lebanon in the mid-1980s (right), both of which were provided to me by a European intelligence official in 1988 who wanted them published. Already by that time, Mugniyeh had become notorious for kidnapping and murdering William Buckley, the CIA Station Chief in Beirut, and other Americans. He was believed to have been the mastermind of the April 1983 bombing of the U.S. embassy in Beirut, and the October 1983 bombing of the U.S. Marines barracks at Beirut airport, which took the lives of 241 Marines. 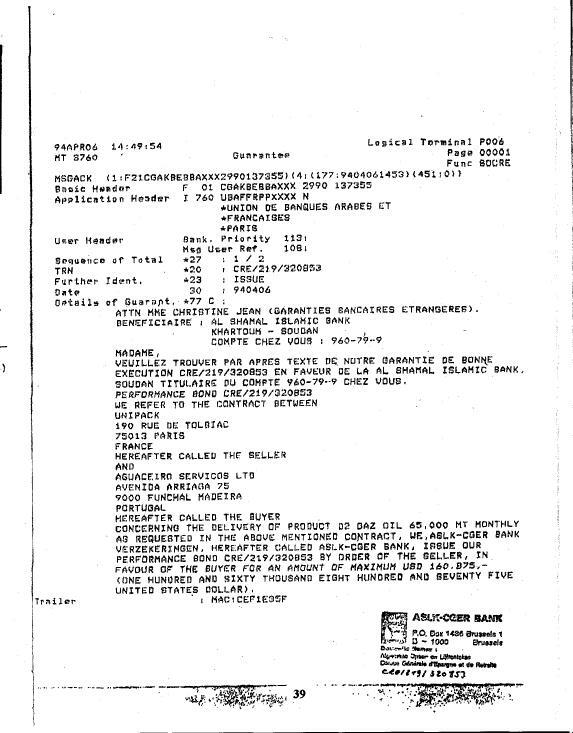 In 1985, FBI agents sent to Beirut after the hijacking of TWA Flight 847 from Athens found were able to match a fingerprint found in the rear lavatory of the aircraft with those from Mugniyeh's Lebanese passport file. This exclusive document, obtained from an Iranian defector in 2004, reveals Iran's direct, material involvement in the 9/11 plot. Dated May 14, 2001, from the head of the Leader's Intelligence Office, it lays out the guidelines established by the Supreme Leader for joint operations with al-Qaeda. "It was the equivalent of a Presidential Decision Directive in the United States, the top-secret documents that guide policy makers in developing specific operational plans." [p16]. Read the English translation here. 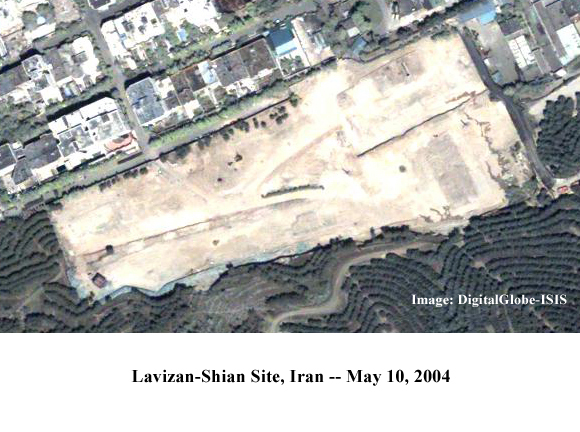 Iran had business ties with Osama bin Laden going back to the early 1990s. 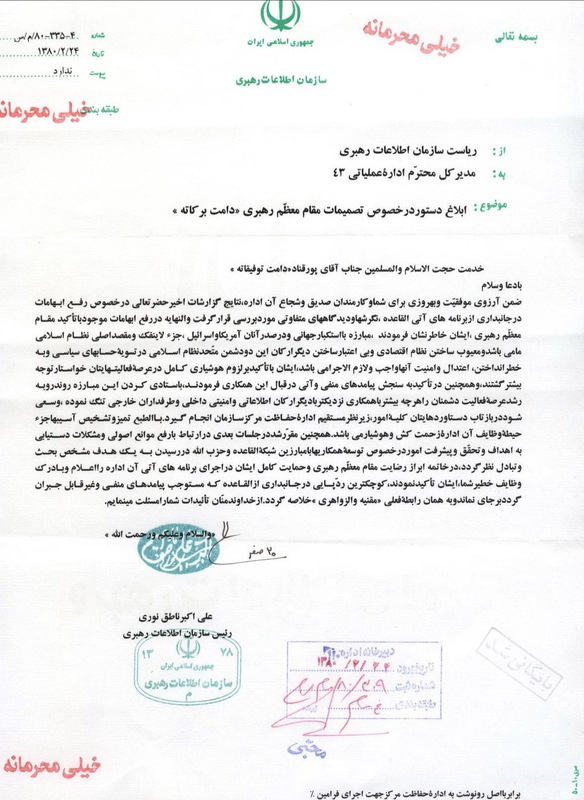 This document, presented by the opposition Iranian People's Fedaii Guerrillas to the UN Security Council in 1996, details the purchase of Iraqi oil products smuggled through Iran by Iranian Revolutionary Guards Corps in violation of UN sanctions. The ultimate purchaser was the Al Shamal Islamic Bank in Sudan, in which Bin Laden had an ownership stake [p352]. This document is prima facie evidence that the IRGC was working closely with al Qaeda for several years before the 9/11 attacks. 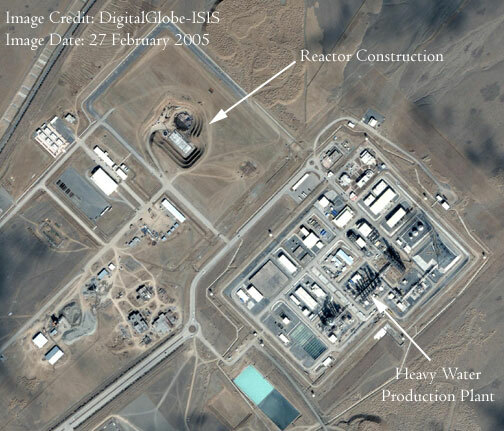 Satellite imagery of nuclear sites. 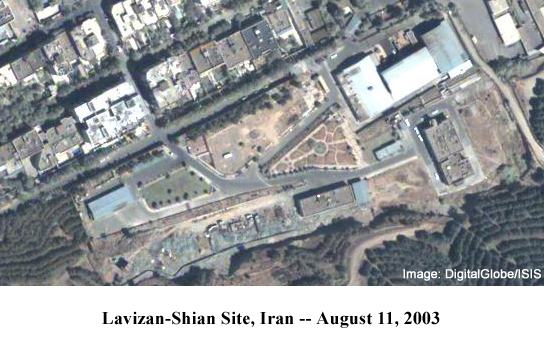 This image from DigitalGlobe and GlobalSecurity.org [p363] shows the underground production halls of the Natanz centrifuge enrichment facility just after they were covered over with dirt to hide them from satellites. 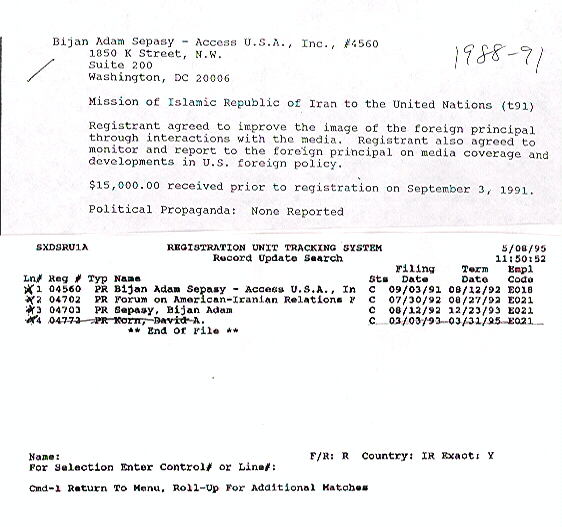 Bijan Sepassy's FARA registration. Mr. Sepassy, who continues to offer his services to groups opposing the Islamic Republic, such as the Iran Freedom Foundation, was a registered lobbyist for the same regime he now says he opposes. He set up a lobbying organization - the Forum on American-Iranian Relations - that took money from Tehran. These documents come from the Justice Department's Foreign Agent Registration database for the years 1991-1993. 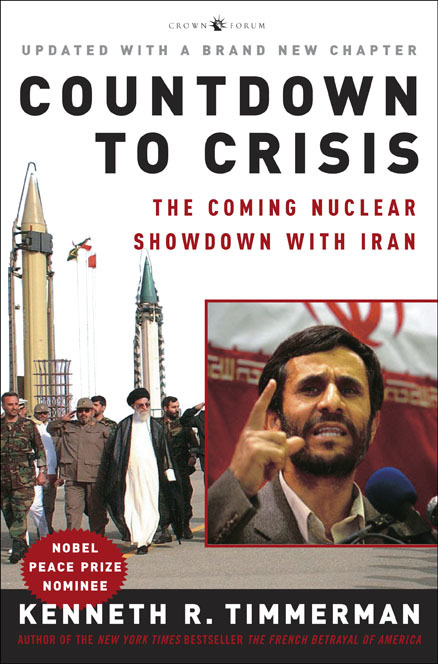 Sepasy claims he represented Tehran at the urging of U.S. government officials. 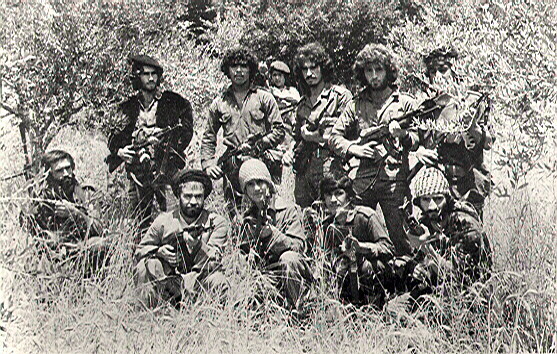 Ahmad Khomeini and Cuban revolutionaries.